"I'm proud to be an old-fashioned patriot. And I'd destroy any enemy if it meant saving my country. Now what in the hell is wrong with that?" Cold War thrillers may seem dated today, but back in the 1960s, when itchy fingers on both sides of the Atlantic seemed poised to press the doomsday button, such movies provided riveting, nail-biting entertainment. No issue of the era possessed more topicality or could produce such far-reaching and devastating effects, and Hollywood happily exploited our apocalyptic fears. Although films such as Fail-Safe, Dr. Strangelove, and On the Beach dealt with the nuclear threat in different ways, they made potent, often searing points that forced audiences to sit up and take notice. The Bedford Incident is one of the minor entries in this mini-genre, but the strong performances and brutal climax make it memorable and affecting even today. Interestingly, director James B. Harris shot the film in England, and, as a result, was able to take a more renegade view of the world's political climate. While the U.S. was largely regarded as the global watchdog with respect to Communist proliferation, many countries expressed concern over America's superpower mindset and overzealous policing. Could our righteous fervor, they wondered, be equally as dangerous as blatant Soviet aggression? The Bedford Incident explores this idea by depicting the horrific consequences such ardent patriotism can inspire. Richard Widmark stars as the tough, gruff, passionately nationalistic Capt. Eric Finlander, commander of the USS Bedford, a destroyer deployed in the far North Atlantic to monitor Soviet sub activity. While not as severe or unstable as his literary counterparts, Capt. Bligh (from Mutiny on the Bounty) and Capt. Queeg (from The Caine Mutiny), Finlander nevertheless runs a tight ship and drives his overworked crew to the brink of exhaustion. Clouded judgment and heated exchanges ensue, and the atmosphere hits a fever pitch when the crew learns a Russian sub may be tracking the Bedford's maneuvers. Dismissing all reasonable advice, Finlander refuses to sit idly by, even though no hostilities have been declared. He decides to alter course and pursue the sub through tricky ice fields, oblivious to the potential physical and international risks. 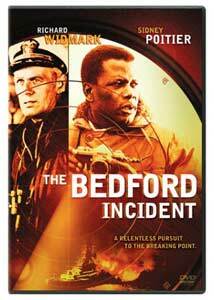 Cocky journalist Ben Munceford (Sidney Poitier), dispatched by a news magazine to profile Finlander, struggles to make sense of the commander's actions, but can't rationalize his extreme, pigheaded beliefs. As tensions escalate, Munceford and newly arrived ship's doctor Chester Potter (Martin Balsam)�the only two men not yet browbeaten by Finlander's despotism�confront the captain, but fail to convince him to back down. Although Finlander remains in charge of his faculties, his nervous crew begins to falter, and a simple misunderstanding sets in motion a tragic series of events. The film starts slowly—very slowly�but its dry, procedural tone methodically becomes more personal and dramatic. James Poe's literate screenplay tends to preach at times, but cleverly and unobtrusively foreshadows the impending crisis through terrific character delineation. The script wisely ignores the Soviet perspective, focusing instead on the American ideals and attitudes that spark the confrontation. Keeping the sub hidden adds to the ominous mood and makes deciphering and analyzing the motives and moves of the cat-and-mouse game more challenging. We certainly don't sympathize with the Soviets, but neither are they portrayed as the personification of evil (as in other Cold War thrillers). The only villain of the piece is the war itself and how it can provoke men to take such harsh and unforgiving action. The American cowboy mentality gives us pause (and strangely relates to our current situation in Iraq), while making us remember what a tenuous tightrope the U.S. and Soviet Union often walked, always teetering on the precipice of global destruction. Widmark easily could have gone overboard in his interpretation of Finlander, but he smartly restrains himself, only betraying glimmers of instability. His portrayal of a man blinded by an almost demented sense of patriotism ranks up there with his best, and least affected, work. Poitier (who teamed with Widmark 15 years earlier in Poitier's film debut, No Way Out) also distinguishes himself in a far less animated role. As the observer, he's often pushed into the background, but his strong presence commands attention, and we see the film through his eyes. Excellent supporting work from Balsam, James MacArthur, Eric Portman, and Wally Cox add meat to the story, and be sure to keep an eye out for a young Donald Sutherland (in only his second film) as one of the destroyer's medical staff. The Bedford Incident can't be considered a classic, but it provides a sober, unsettling snapshot of a turbulent period in American history. The suspense doesn't really kick in until the final half hour, but the uneasy, claustrophobic atmosphere and fine performances help build tension throughout. Although some might consider the ending overly abrupt, it leaves the viewer breathless, and forces one to reflect on the film and its stark, unsettling message. Image Transfer Review: Presented in anamorphic widescreen, the black-and-white transfer looks overly flat and dull. A gray pallor afflicts the image, which could also benefit from sharpening. Contrast is weak, although blacks can often be rich and vivid, and only minor speckling intrudes. Some might argue the transfer's coarse, gritty appearance compliments the naval backdrop, semi-documentary style, and bleak Cold War themes, but a little more vibrancy might have heightened the tense mood even further. Strangely, The Bedford Incident is one of the few recently released Columbia classics that hasn't been remastered in high definition, and yet seems more deserving of the red carpet treatment than previous films. Audio Transfer Review: The mono track meets the necessary requirements, but doesn't offer anything above the norm. Dialogue is clear and understandable, and no defects exist, even during long periods of tense silence. Extras Review: A few trailers are the only extras offered. Not quite a Cold War classic, The Bedford Incident nevertheless delivers quiet, steady suspense and addresses sufficiently disturbing themes. Widmark and Poitier make a formidable team, and their talent lends the production additional punch. Unfortunately, Columbia's average transfer and paucity of extras preclude a purchase, except by the film's staunchest admirers.